Choosing a good lawn mower service is not a simple task, and you may feel confused the first time doing it. So, in this article, we would like to provide some useful tips to choose a good lawn mower service. Keep reading! What is lawn mower service? You may think that this question is too simple to answer, but actually, there is one thing we usually misunderstand when talking about lawn mower services. First, we can understand that a lawn mower service is a lawn mower rental service or even the service in which a company will use their lawn mower to take care of your garden. Second, we can understand that a lawn mower service is the service for your lawn mower like a lawn mower repair or maintenance service. And in this article, we would like to mention about the services for your lawn mower because it seems like a hot topic, and we have received many emails asking about this topic. So, now we would like to provide all of the information you need in this article and hope that you will feel it is useful for you. Why do we need the service for our lawn mower? There are two reasons why we need the service for our lawn mower. First, like the other machines, lawn mowers cannot always run smoothly. During the using process, we may encounter some kinds of issues like: broken cutting blade, leaking gas…. And our lawn mower will need to be fixed so that we can use it again. Second, we cannot fix all types of lawn mower issues by ourselves because some types of issues are too complicated, and we need an expert engineer to fix it for us. That is the reason why sometimes we need to find a good lawn mower service company and bring our machines to them. There are many kinds of service that a lawn mower service company can provide you. But as we mentioned above, there are two main kinds of lawn mower services, including a repair service and maintenance service. All kinds of lawn mower services can be categorized into one of them. For example, if some parts of your lawn mower has broken, and you cannot use your lawn mower, then you must buy a repair service for it. But, if your lawn mower is still working well, but you would like to prevent it from the unexpected issues, then you must buy a maintenance service for it. The cost of a maintenance service package is usually published on the website of the company. If not, you just need to call directly for them and ask for the information of the maintenance service package. If you buy a repair service package, there are some different things comparde with the maintenance service because the price of each repair service package cannot be fixed. They will change according to the complicated level of each issue,as well as the price of the affected parts that need to be replaced. In fact, the repair steps and maintenance steps of different service companies will not be the same. They usually are a little different, depending on the characteristics of the company. But, generally, they will include all of the main steps we have mentioned above. Normally, when you buy a lawn mower, you will have the warranty policy of the manufacturer, and the warranty time can be one year or even more. It means at this time, if you encounter any issue of your lawn mower, you will have it fixed by the customer service team of the manufacturer without any costs. But if you encounter any issue when the warranty time has already expired, you will be charged as usual. In this situation, finding a local service company near your house, which can provide you the same service quality but with lower lawn mower service cost, will be a better solution. So, in this article, we would like to introduce some useful tips to find a good lawn mower service company in your area. You should consider this criterion in case of you need to transfer your lawn mower to their company. Even if their service team comes to your house, a short distance will help to improve the speed of the progress significantly. These criteria are the reliable proof of a good lawn mower service company. You should research about the seniority and reputation of each company carefully by using the internet or asking your friends and family. Word of mouth is usually a better information channel. After gathering enough information, just choose the companies that have long time experience and a good reputation in the lawn mower service field. Besides the quality, the price of the service is also an important criterion that we should consider when choosing a good service company. In the list of potential companies that you have just filtered through the criteria above, choose some companies that offer appropriate lawn mower service costs, and you ones that you can afford. But please remember that the quality of the service is usually equal to the price of it. So, if there is any company that offers you a service package with a cheap price, please consider it carefully. After going through step 1, you may have a list of several potential lawn mower service companies. Then, in this step, you should call each of them to ask carefully about the terms of the contract. You can ask them to send you an email with specific information of the terms, so that you can consider and compare between each company easier. After that, choose a company with the most suitable terms which provide you more benefits and make you feel satisfied when using their service. When you can identify the most suitable company to buy their service, call them again and ask them about their after sales policy. The after sales policy of a company is very important because it shows their commitment to you when you use their service. A good lawn mower service company always has a professional after sales policy. For example, they will commit to repair your lawn mower without any cost if the issue still reoccurs after using their service. So, ask about their after sales policy carefully, and only sign the contract with them when you are completely satisfied with their policy. 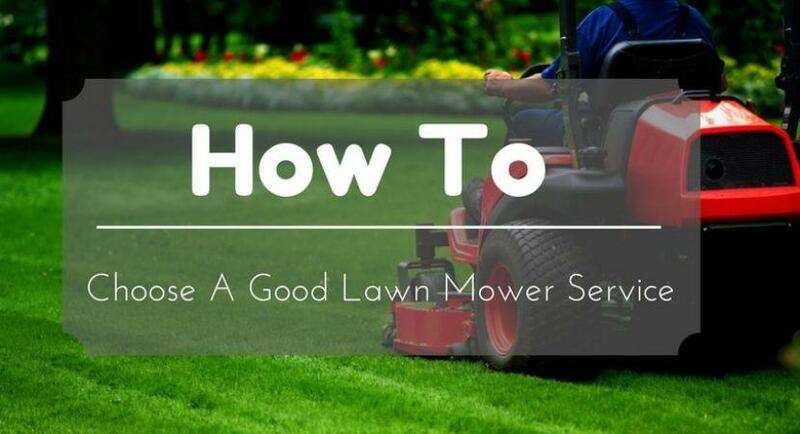 After reading this lawn mower tips article, you may have the knowledge about each type of lawn mower service, as well as the basic steps in choosing one. Together with the tips to choose a good lawn mower service that we have mentioned above, I think that you can fully find and choose a suitable lawn mower service for yourself. Just follow all of the steps in this article, and you will realize that choosing a good lawn mower service is not a headache anymore. Good luck!